Hello and welcome to the Ruby Boutique. My name is Samantha and I am a fully qualified and insured dog groomer and stylist. I work on a one to one basis with your dog to allow them to feel comfortable and relaxed, and to reduce stress, which is ideal if your dog is nervous or anxious. All services are by appointment only and all grooms are carried out at a pace your dog is comfortable with. I pride myself on a very hygienic practice in my fully equipped salon. I can cater for all dogs, any breed and size. This service will include a warm bath/shower using a shampoo best suited to your dogs skin and coat type, followed by a conditioning treatment if the coat requires it. A blow dry followed by a complete brush out or de-shed of the coat to leave it tangle free, glossy, and smelling beautiful. It will also include a nail trim and ear cleaning, should it be required. This service will include a warm bath/shower using a shampoo best suited to your dogs skin and coat type, followed by a conditioning treatment if the coat requires it. A blow dry followed by a complete clip or cut and style to either breed standard, or the owners specification. It will also include a nail trim and ear cleaning, should they require it. Puppy Grooms (from 14 weeks to 6 months) from £20 – Designed to gently introduce your puppy to being groomed – includes a conditioning bath, gentle blow dry, full body brushing, ear cleaning, nail trim, and light trim if required. Also includes lots of treats and cuddles. Pedicure £15 – For dogs that suffer from sore or cracked paws or matted feet. This will include a foot soak, nail trim, removal of grass seeds and matts from the feet, followed by a massage of the pads using a moisturising paw balm. Face Trim from £8 – Trim of the face and eye area of your dog to keep their eyes clean and free of hair. For dogs that need a tidy up of the face between grooms. Bath, blow dry and brush. Trim of the face, feet and hygiene area, from £25. (Dogs must have been groomed within 6 weeks). Handstrip From £45 – Small Dogs, from £55 – Medium Dogs. Large Dogs quoted on request. Nail Trim and Ear Clean £6. Something a bit creative! 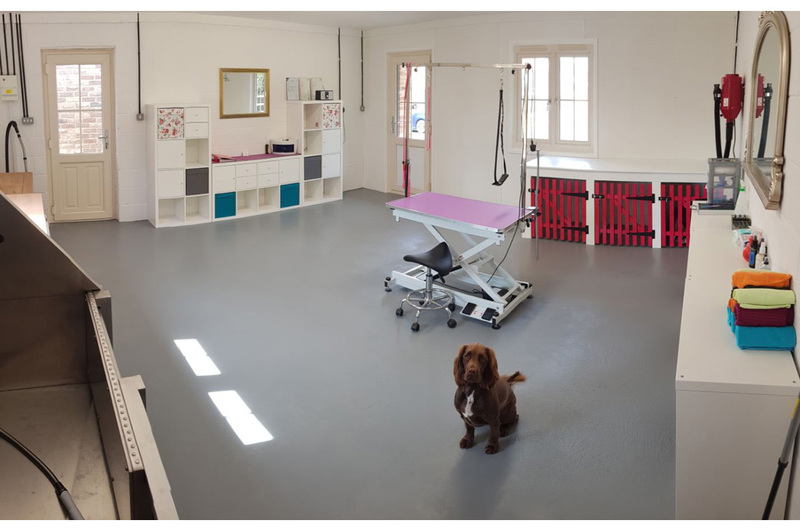 – If you have an idea in mind that you would like for your dog, be it painted nails, some coloured fur, or a unique style or cut, get in touch and we can discuss the endless possibilities. (Subject to your dog being comfortable with any processes – the welfare of your pooch will always take priority). If there is a service you require that is not listed, please get in contact and I will be happy to discuss. EXTRA SMALL breeds include: Chihuahua, Japanese Chin, miniature Yorkshire terrier. SMALL breeds include: Jack Russell, Yorkshire Terrier, Lhasa Apso, Shih-tzu, West Highland Terrier, Bichon Frise, Cavalier King Charles. MEDIUM breeds include: Border Collie, Springer Spaniel, Airedale Terrier, Bearded Collie, Labrador, Boxer, Bulldog. EXTRA LARGE breeds include: Great Dane, Newfoundland. Please note: All prices quoted are ‘from’ and are based on dogs that are regularly groomed within the recommended time frames. Fantastic service and price x 1st experience for my puppy will defo be booking my other dog in. very friendly professional service. Great job thank you x defo recommend. I had the pleasure of taking my Border Terrier for a groom on Tuesday…what a brilliant service. Contacted via Facebook to enquire about price, very quick response followed by available times, so appointment booked. The service was exceptional such attention to detail and nothing too much trouble. Loved the extra touches too…bow and treats. We will definitely be returning and recommend you do too…. Sam done an amazing job with our one year old pup. He came home looking and smelling beautiful! Sam was very professional throughout and I would highly recommend her. Thanks again! First Class professional and friendly service. So pleased that I booked my dog in for his first visit but it certainly won’t be the last. Don’t hesitate, book your dog in for their pamper now. Fantastic experience. Charlie looks and smells amazing. Sam really listened to how I wanted him to be clipped and I am chuffed with the results. Collected one happy pooch who has been well looked after and thoroughly spoilt x see you again soon! We are a fully qualified & insured dog grooming salon in Coates, Whittlesey, Peterborough. We work on a one to one basis with all dogs to allow them to feel comfortable, relaxed and stress free during their visit.